Ruth D. Remick, age 88, of Oquawka, Illinois passed away at the Great River Medical Center in West Burlington, Iowa on Saturday November 17, 2018 at 12:20 pm. Ruth was born on August 14, 1930 on the farm near Cedar Creek in Jefferson County near Fairfield, Iowa and is the daughter of Marvin and Christina Harm Overlander Giberson. She was raised in Bonaparte, Iowa where she attended the Stockport rural school and graduated from Bonaparte High School. Ruth married Donald Paul Remick on January 30, 1954 in Gladstone, Illinois and he preceded her in death on April 27, 1994. For many years Ruth was a switchboard operator for the telephone company in Mt. Pleasant, Iowa. She also was employed for a number of years at the Dimestore. 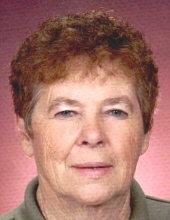 She later worked for Lehigh Leopold Company in Burlington for a time and then was employed at Maytag in Galesburg, Illinois until her retirement in 1993. Ruth was known for and loved crafting and making craft items. She is a member of the Oquawka United Methodist Church in Oquawka, and it's United Methodist Womens. She loved working in her garden and tending to the yard. She liked going to play Bingo in Burlington, Iowa and going to the Casino. Her greatest love was of her family and grandchildren. She is survived by her daughters, Rhonda Olson (Paul), Karen Slater (Bill), and her son, Rodney Remick all of Oquawka, Illinois. She has numerous grandchildren and great grandchildren also surviving. Her sister, Jan Keefer of Plainfield, Illinois also is surviving. She is preceded in her death by her parents, husband, two twin daughters, Lynn and Lore, and two brothers, George and Jack. To send flowers or a remembrance gift to the family of Ruth D. Remick, please visit our Tribute Store. "Email Address" would like to share the life celebration of Ruth D. Remick. Click on the "link" to go to share a favorite memory or leave a condolence message for the family.